I logged on to Twitter on Sunday morning. Twitter is a great source of up-to-date reading material. It’s always interesting to see what articles or blogs people have posted links to, and it’s always nice to see when people have commented on or shared links to the blog posts I write here on Waymarks. Hence I was initially quite chuffed to see a familiar photo pop up in my timeline. It was familiar because it was a photo I had taken. 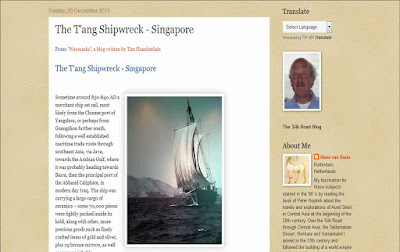 A quick glance at the accompanying text suggested it linked to my latest blog post on Singapore’s “T’ang Shipwreck,” which was heartening, but something seemed odd. 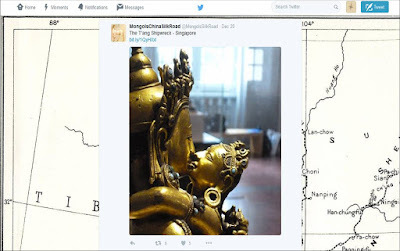 The image was of a bronze statue from Tibet or Nepal ... The image had certainly featured on my original blog post, but it’s not an object from the shipwreck which the title of the article refers to … Curious I clicked the link (which wasn’t recognisable as it had been shortened using Bitly). To my baffled surprise it didn’t take me to Waymarks but instead it took me to an almost identical version of my original blog piece on someone else’s blog entirely! My latest blog post has been appropriated in its entirety without my permission. I quickly overcame my stunned and rather uneasy sense of disbelief. Surely there must be some mistake? A closer look showed the blog piece had duly been credited to me (which was a small relief), but checking back on Twitter and then on my blog itself I could find no message or notification from the blogger who had purloined my piece. He doesn’t even follow me on Twitter! Fortunately I follow him, or else I might never have seen or been aware that this had happened. I sent him a message, and he replied immediately. But here’s where I found myself posed with a bit of a dilemma. 1. He did this without asking my permission and without even having the courtesy to notify me. 2. He had duly credited me as the original author and there is a link back to my blog. 3. I pointed out what he’d done was at best impolite. 4. He apologised and said he would not do it again. 6. I still feel annoyed about it. I am uneasy about letting my piece stand on his blog. It has after all been appropriated and modified in its entirety without my permission. But it could have been worse, I suppose. It has flagged up an important issue. Posting anything on-line automatically makes it fair game for poaching. Funnily enough only a few days before I’d been part of a discussion on copyright and the terms of ‘fair use’ with some fellow bloggers on Twitter. From time-to-time I, myself, have used other people’s work (mostly images) on my blog. I’ve always sought to source material which is clearly in the ‘public domain’ or that would reasonably count as ‘fair use’, and if copyright infringement has appeared to be a potential issue I’ve always sought permission to use the image from its owner wherever I can first. It’s amazing the generosity I’ve encountered in this respect. I’ve never yet been turned down in fact. 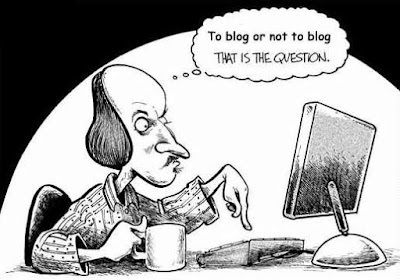 Hence I’m sure if Mr Van Roon had simply taken a moment to ask me first I may well have been only too happy to give him the thumbs up and say “go ahead.” After all, this is why we blog – to freely interact and share with one another. 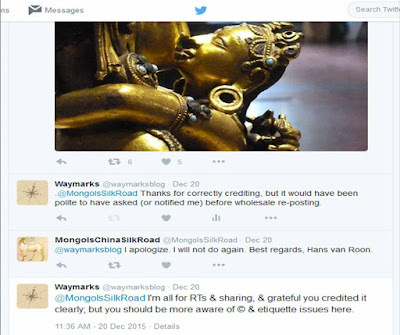 In essence Mr Van Roon has disregarded the fundamental etiquette and goodwill of blogging. It’s sad that this kind of thing occurs. Looking at my site stats his appropriation of my blog post has sent very little traffic to my blog, even though the link to the piece as it appears on his blog which he posted on Twitter has been ‘liked’ and ‘retweeted’ by a fair few people. Should I be flattered and grateful he has shared my work on his evidently quite popular blog? Is this a kind of free publicity? Or have I been robbed? … His blog is mainly a digest of recycled works by other people raked in from across the web. One wonders how much effort that takes compared to me sitting down, writing the piece, editing it, selecting the photos, editing and arranging them, before actually posting the finished piece to my blog? It probably takes him only a fraction of the time and effort. Is this just sour grapes, or am I right to still feel disgruntled? 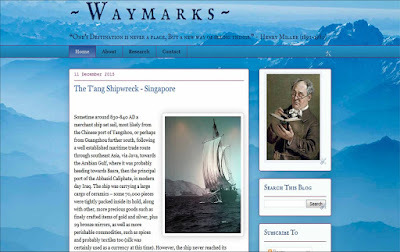 I’m more than aware that Waymarks gets mined daily for images. The site stats tell me that “Google image search” is a major source of traffic to the blog. Sometimes I can even see the search terms (“Leonardo’s Venusian Man” is an oddly regular one which actually quite amuses me). This is why I often keep the images fairly low resolution; that and the fact it makes the blog load easier and more quickly on your browser. I resolved early on that “if it’s too precious, I won’t post it.” But sometimes you don’t realise how precious something is until someone else nicks it! Maybe today’s blog post, so to speak, is purely tomorrow’s digital-microchip paper? … But it’s the principle of the thing which bugs me most here. He could have asked. It only takes a moment longer than the moment it took to pinch the piece. And if he had, we’d both be smiling now, rather than one of us frowning quite hard at the other.